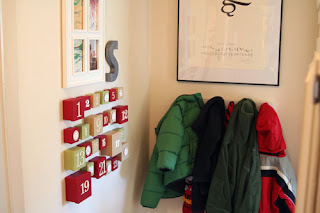 I first saw this crafty advent calendar on Ali Edwards, this picture is from her blog. And she wrote that she got the idea from Martha Stewart. I had great intentions of making one and posting it on the blog but I still have so many Christmas presents to make that I can't pull myself away. I am so behind this year in making gifts. Normally I'm done by this time and have time to pursue crafty endeavors like the advent calendar boxes. Oh well...tis life. What I plan to do with my advent calendar boxes, and why I don't want to rush myself to make it, is to have a family activity for each day and print the activity out and attach to the inside of the box and also to make an ornament for each box that symbolizes the activity. For example each year we watch Charlie Brown's Christmas. So I plan on making an ornament to symbolize that, maybe recreate the tree or felt a little snoopy. I'm really looking forward to starting this tradition in our family. And I may even start them early and give them as gifts for next year! I'll keep you updated.